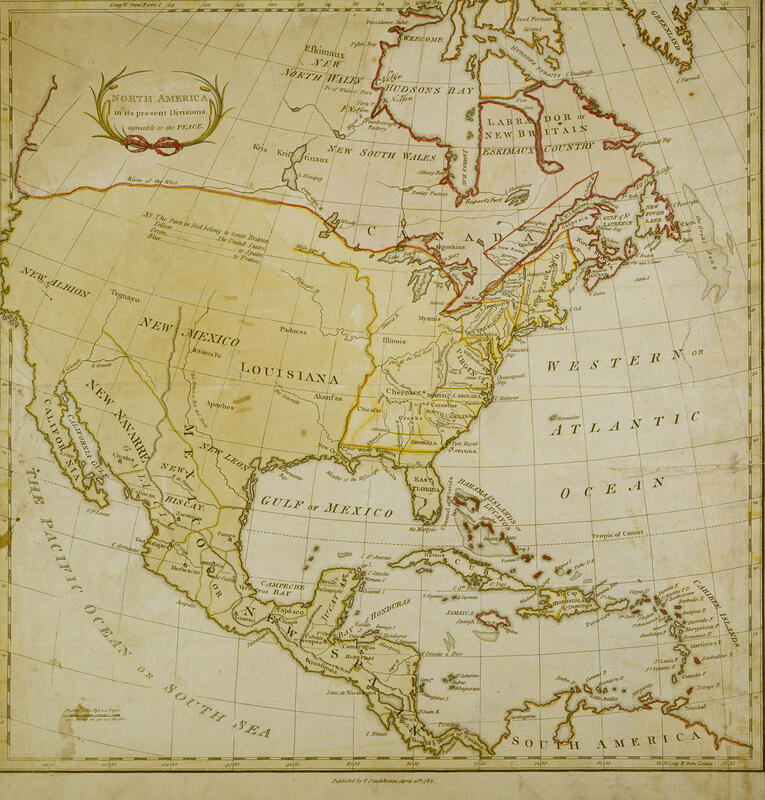 Map by T. Stackhouse, publisher 1783, prior to Louisiana Purchase. 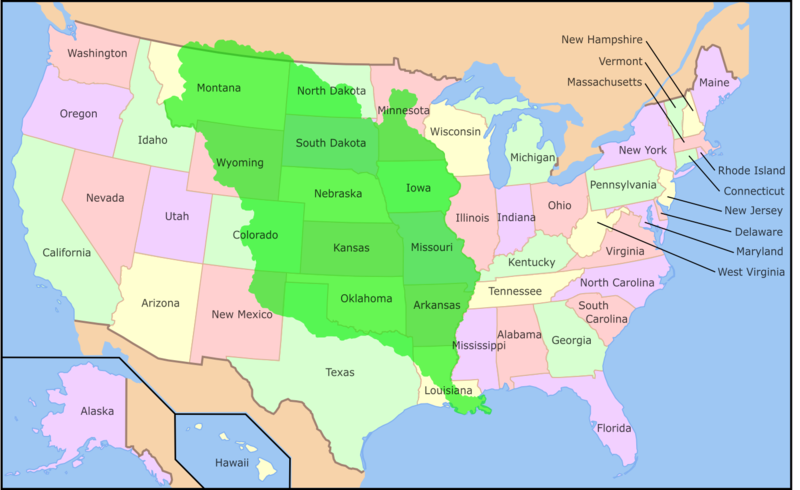 The Louisiana Purchase is much more complicated than most history textbooks portray. That’s the message behind the Missouri History Museum’s new exhibition “The Louisiana Purchase: Making St. Louis, Remaking America.” Adam Kloppe, 30, is a writing and research fellow at the museum and took the lead in determining the content for the exhibit. He said the story of the Louisiana Purchase is a one of many doubts and tough decisions. “We’re trying to present our visitors with a chance to weigh those pros and cons and to think about how difficult these decisions must have been in that moment,” Kloppe said. His enthusiasm for the exhibition is almost palpable. He sees the show as a chance to get at the real drama behind the documents that doubled the United States in 1803 and paved the way for the country we know today. Exhibition contributors discuss the real life drama behind the Louisiana Purchase Treaty. The Louisiana Purchase exhibit, which is free, opened Oct. 25 and runs until April 19, 2015. It was organized in partnership between the Missouri History Museum and the National Archives and Records Administration. The exhibition’s core, the Treaty of Cession, known as The Louisiana Purchase Treaty, was provided by the National Archives. This is the first time in more than 10 years that the treaty will be on display. It's considered one of the five most important documents in American history, but that grand history wasn’t always foreseen. “No one really knew what was in Louisiana. It could have been a vast desert for all anybody knew,” said Kloppe. The document was signed by American forefathers Robert Livingston and James Monroe and French statesman Francois Barbe-Marbois. “They had to consider that they didn’t actually have the money to pay for Louisiana so they didn’t know how (President Thomas) Jefferson would react. There were a lot of good reasons for them to walk away from the deal if they wanted to,” said Kloppe. The exhibition is devoted to the moments of political complication and indecision. Documents signed by President Thomas Jefferson, his notes, and a letter from St. Louis inhabitants to the people of the Louisiana Territory are some of the papers displayed as supporting evidence to the Treaty’s story. In all, ten documents from the National Archives will be displayed including a convention that dealt with payment of 60 million francs, and another that dealt with forgiving claims made against American citizens by the French. It took five weeks for news of the Treaty’s signing to travel from Paris to Washington. During that time Jefferson wrote Monroe and Livingston with numerous instructions on how the treaty should be negotiated, unaware the land deal was already complete. In early October, the exhibit's construction was underway but one could discern what the final exhibit might look like. 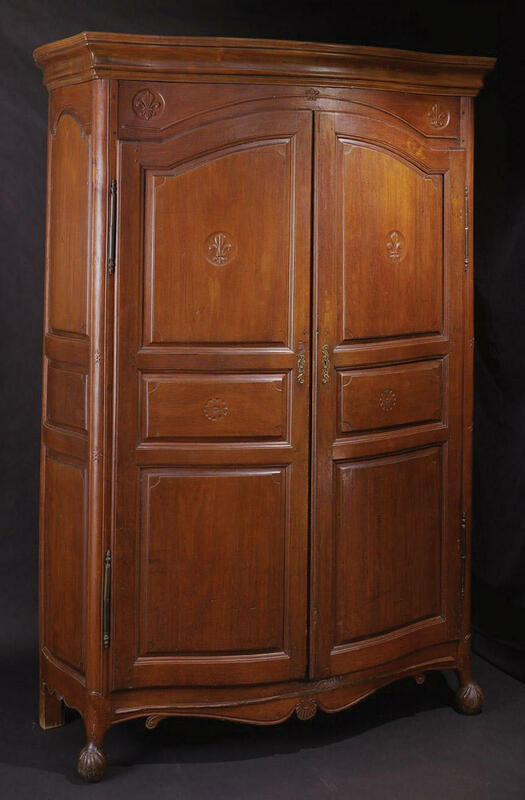 French colonial armoire from the Chouteau Family, 1770-1800. Contractors were attaching information panels to walls. Cases sat half empty. In one, a fan owned by Thomas Jefferson was splayed open as though ready to cool down visitors. Another case held one of the president’s chairs. An armoire owned by the Chouteau family sat in a different room. Those and roughly 90 other objects from the museum’s collection are displayed to provide context and insight into the time during which the Louisiana Purchase Treaty was signed. Each exhibition room has a different designation. The first space is dedicated to early St. Louis and a time when St. Louis was “a village with French culture being governed by Spanish rule,” according to Kloppe. The second section focuses on the halls of Washington and Paris, where decisions were made that directly affected the Treaty’s execution. 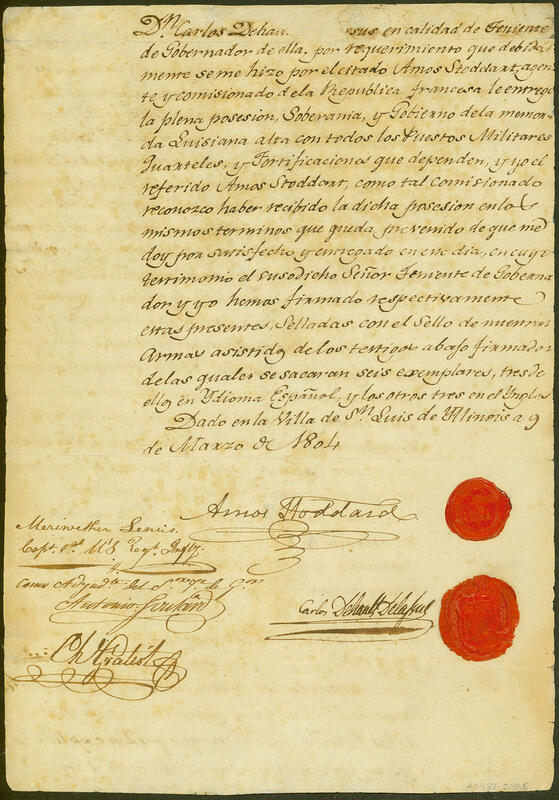 The third space explores the trade conflicts with Spain and the immediate events leading up to the decision to purchase the Louisiana Territory. Another room holds the original Treaty of Cession, a document that fundamentally changed the geographic and demographic shape of the United States, but was likely processed from old rags. Additional rooms are dedicated to the subsequent debates about how to govern the Louisiana Territory, the Louis and Clark Expedition, and the evolution of St. Louis and Missouri. For exhibition designer Matt Gurley, 46, the challenge was two-fold: He had to conceptualize entering the space as just another member of the public and had to make that concept a physical reality. The second task can sometimes prove the most difficult, ensuring that necessary steps are taken during installation. “That’s the most challenging part of this, we’re coordinating with 10 or 15 contractors, also coordinating with our collections staff on getting artifacts over here, and all trying to work together and stay out of each other’s way,” said Gurley. Historian and Washington University professor Peter Kastor said the Missouri History Museum’s attention to the complications surrounding the Louisiana Purchase Treaty signing is significant. He said the doubt helps characterize these lions of American history as human beings. Upper Louisiana Transfer Document, page two, March 9, 1904. Kastor said that these fears extended to revolt and the inability to rule the new U.S. territory. One such incident involved the story of the day the American flag was raised over St. Louis. One man attempted to raise three cheers to celebrate the change in government. He was met with silence by the surrounding crowd. Indeed, Kastor maintains that people learn about the Louisiana Purchase because many of the fears shared by leaders and new citizens simply didn’t come to pass. “Instead of regional chaos, you find in the newly created states, the places that made a relatively quick transition to statehood,” said Kastor. That quick transition provided the foundation for the current belief that the entire process went smoothly and was successful. If you didn’t have your boss’ approval or didn’t have the money, and weren’t quite sure what you were actually buying ... Would you have bought the Louisiana Territory? St. Louis on the Air discusses issues and concerns facing the St. Louis area. The show is produced by Mary Edwards and Alex Heuer and hosted by veteran journalist Don Marsh. Follow us on Twitter: @STLonAir. Beginning this fall, St. Louisans will be able to see the actual document that made what is now Missouri part of the United States. In 1803, the United States bought more 828,000 square miles of land from France for $15 million – roughly four cents an acre – in a deal known as the Louisiana Purchase. The parcel immediately doubled the size of the country and eventually became part or all of 14 states from Louisiana to Montana, including Missouri, Iowa and Arkansas. Nearly 40 years ago, Brian Hyland’s song "Gypsy Woman" played on a Jukebox and former St. Louis resident Lee Maynard found his name for performing in drag: Gypsy Lee. It was the first song that came on and someone said that was a great name. Maynard agreed. When Maynard performed as Gypsy Lee around St. Louis in the 1970s, his standby song was Cher’s "Half-Breed." It’s a song that matched his elaborate costume.